Kingdom Konsultant Travel Blog: Review: BRAND NEW! 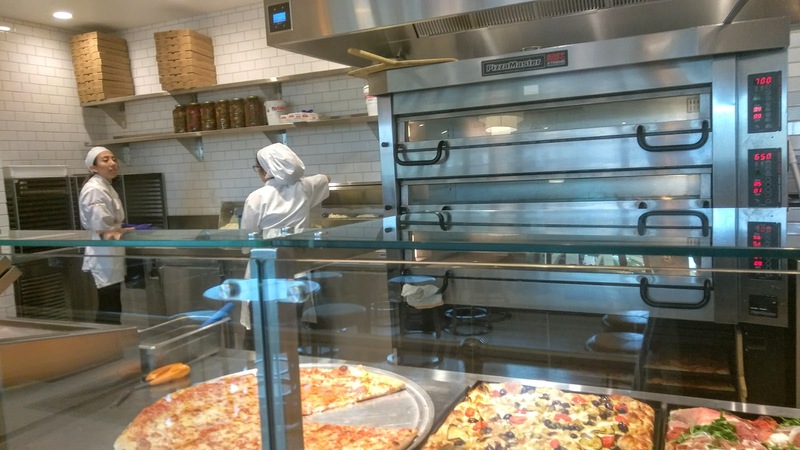 Pizza Ponte at Disney Springs! 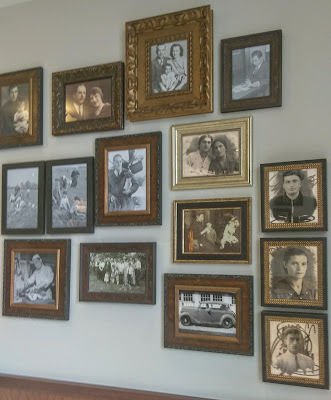 Fun Stuff: The story line of this pizzeria is that it was run by Maria and Enzo, an Italian-American couple, in the 1920's. 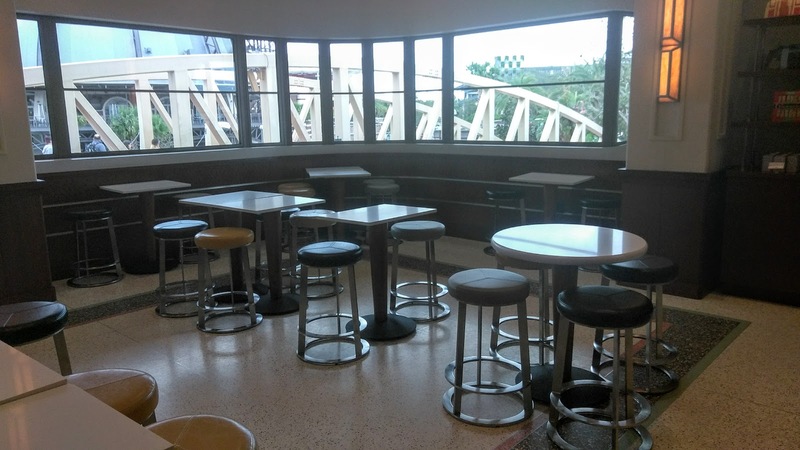 It was originally established as a bakery, in the lobby of a small air terminal. When the terminal closed down, the couple opened their full service restaurant, Maria and Enzo's, (located next door), and also secretly ran Enzo's Hideaway Tunnel Bar during Prohibition. 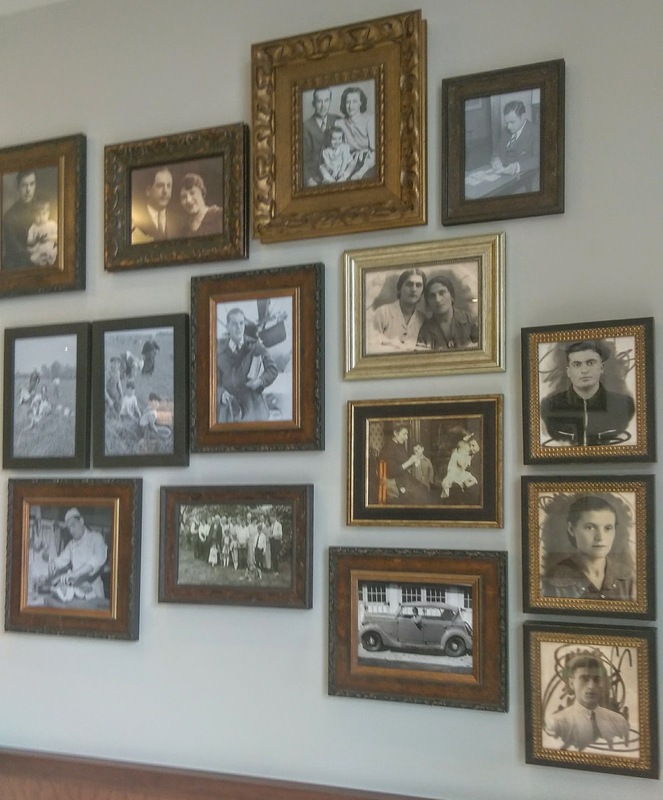 The walls are covered in family photos for authenticity, and as a nice, modern touch, diners can find easily accessible electrical outlets for phone charging, at both stand-up stations, and near the tables. 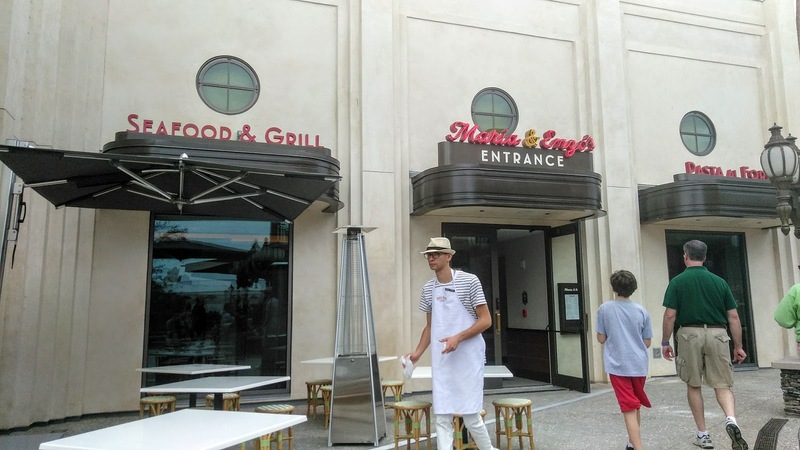 Experience: I was at Disney Springs with my kiddos last weekend, right as things were opening up, in the late morning, and of course, they were starving. (After all, it had been about an hour since we last ate!) When asked what they wanted, both kids said pizza. Now, at Disney Springs, we love Blaze. 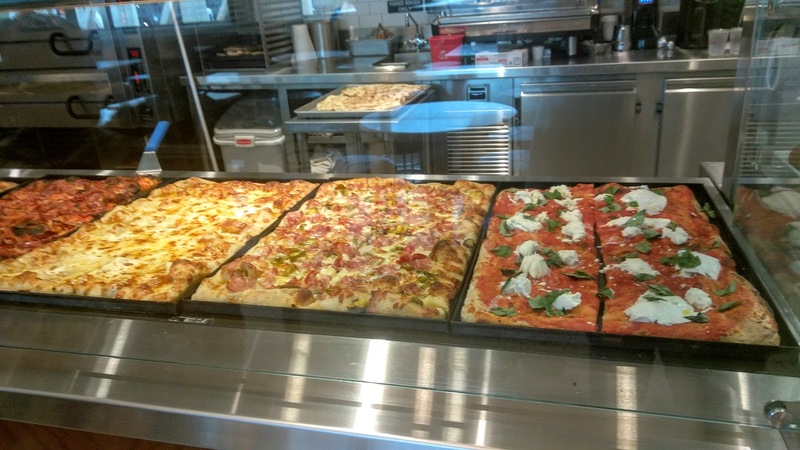 The pizza is good, fast and pretty reasonably priced, at around $12 for a pie that the three of us can share, however, Pizza Ponte had just opened within the past month and we were ready to check out something new, so we headed on over that way. 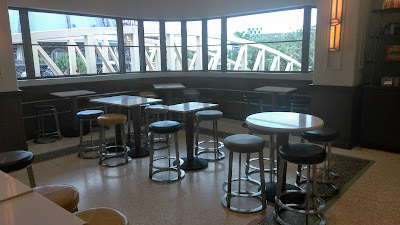 When we arrived at Pizza Ponte, it was only barely 11 am, so it was pretty much empty. Immediately, my daughter declared we were eating inside, and my son declared we were eating outside, so already, this was going well. We walked inside the cafe, and took a look at the cafe itself. We were immediately greeted by smiling, friendly Cast Members, welcoming us to the location, and asking if we needed help. Though the inside of the cafe was sleek, clean and comfortable, I was a bit confused to start. 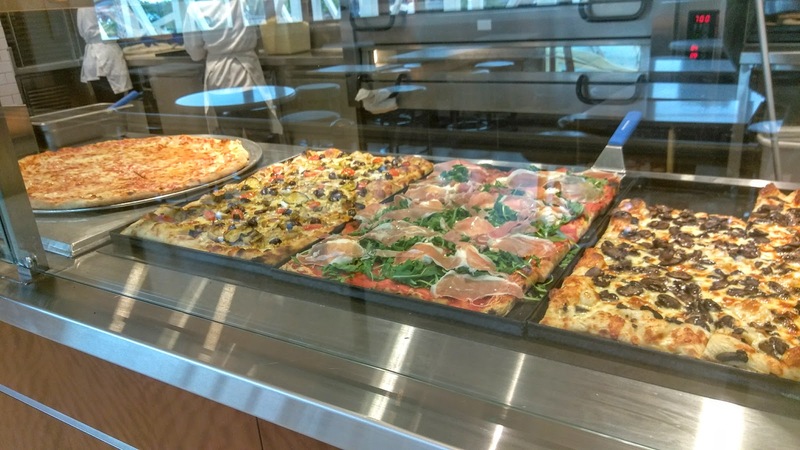 The registers and sandwich/pastry display cases are directly ahead of patrons as they enter, and the cafe extends our to the left, including the pizza kitchen and display areas. This meant that the flow of the line was somewhat counter-intuitive, having Guests move into the cafe first, and then back toward the door. This probably would be more clear if there had been a line, but since we were the only ones there at the time, we danced around a bit, trying to figure out where to view the menu and place our order. A Cast Member noticed our confusion, and welcomed us further down the counter, to show us the pizza options. On top of the counter, there were strips of baked pizza crust with cheese on them, that were available for samples. (And they were quite tasty!) The Cast Member explained the different toppings on the pizzas to us, and also mentioned the sandwiches as well. When I asked about allergens, particularly an egg allergy for my little guy, the chef was consulted and it was confirmed that there was no egg used in the pizza. My kids selected a mammoth piece of Roman round, thin-crust cheese pizza, which the chef happily sliced in two for me when I asked. 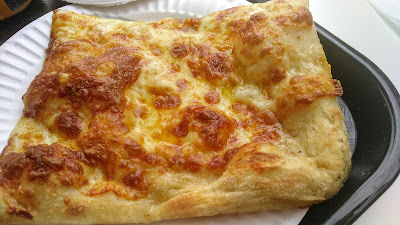 I selected the chef's recommendation, which was the 4 Cheese Sicilian slice, (equally mammoth in size). 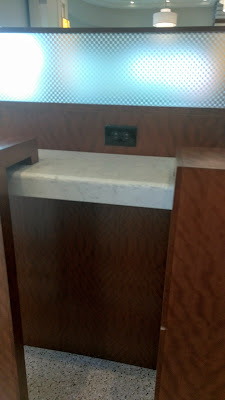 I was tempted to also try a sandwich or salad, since they looked amazing, but since it was still only really breakfast time, and it was just me and the kiddos, I figured I'd wait until next time, when The Hubs is with me too. Now, if our order is far too plain to you, no worries.... there's pizza with roasted cauliflower and broccoli, or hot peppers, onions and parma ham. 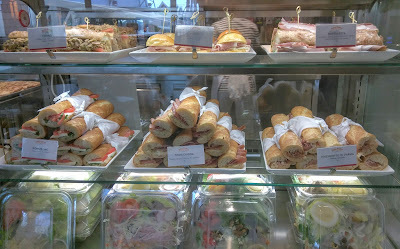 For sandwiches, you can enjoy parma ham and cheese with pickled veggies, or an Italian muffeleta. 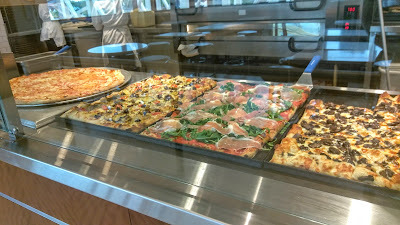 Oh, and all sandwiches are made on tasty, in-house baked "pizza bread", (seasoned pizza dough). If salads are more appealing to you, there's a traditional Italian Antipasti, Caesar, Mistacanza, and Frutti di Mare. Salads are all pre-made, but look fantastic none the less. I know, I know.... overwhelmed with delicious options, right? Plan on sharing! They had a nice selection of Italian beverages, including beer, wine and soft drinks. We went with a can of San Pellegrino Orange Sparkling drink, but next time I will TOTALLY indulge in one of the impressive hot chocolates or espresso drinks! We of course couldn't skip out on dessert, especially since I had not had a decent Italian pastry since I lived in Boston, but I was overwhelmed with choices. Would it be the exotic looking "Cruffin", a croissant/muffin hybrid? The tiramisu? The cannoli? I had to ask the Cast Members for help deciding and they answered in unison, "The Baba!". Clearly a crowd favorite. I, however, am not a big fan of citrus in my pastry, and since the Baba is soaked in orange liqueur, I figured that would not be a favorite of mine. The next recommendation was the zeppole, so that's what I went with. A simple, Italian version of a cream puff. It looked delicious! Unfortunately for my son, there were NO egg-free desserts, so we let him win the battle of where to sit, and we headed for an outdoor table. As soon as we paid, we grabbed a nice, shaded table, and dug in. 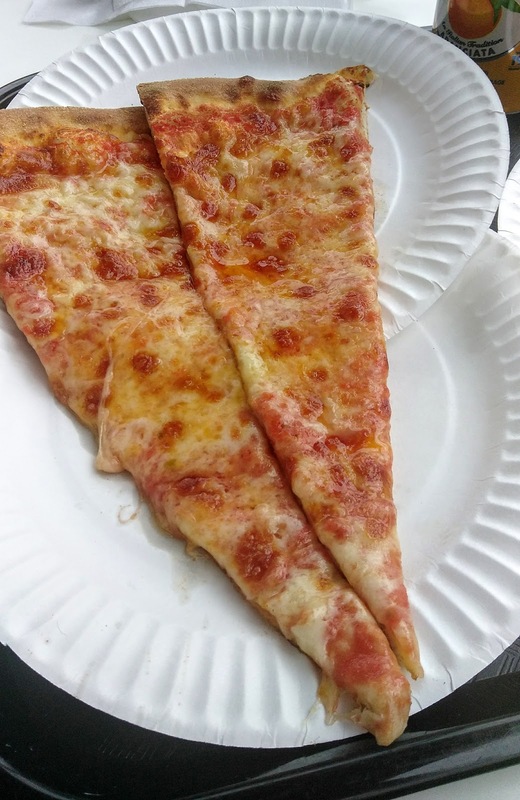 Both of the kids were super excited about the size of their pizza slices, which were dangling over two paper plates each. 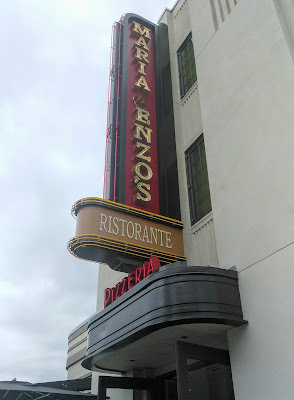 On a side note, yes, the paper plates are probably pretty authentic to Italian pizzerias, but the plates are too thin and flimsy for a family-friendly eatery. We almost lost our slices on more than one occasion. THAT would have been tragic, because this pizza was goooooood! Seriously good. In fact, I'd venture to say the best pizza I have had since moving to Florida. 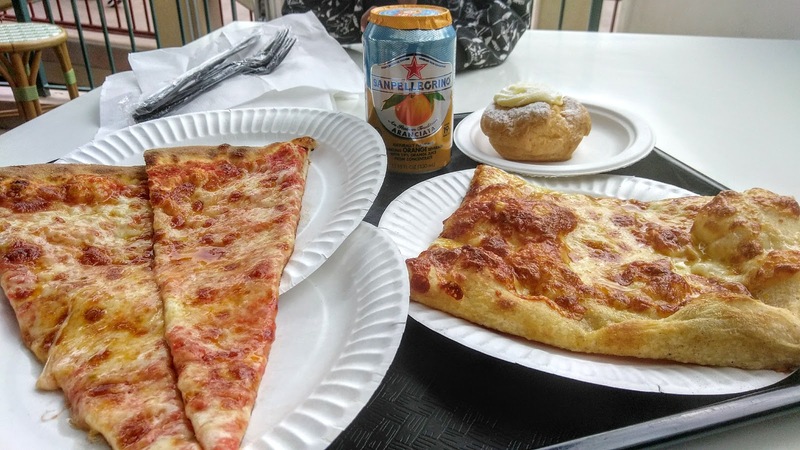 And yes, Florida pizza is notoriously not the best compared to pizza from Boston and New York, (virtual pizza meccas), but we have managed to find a couple of good local places. Pizza Ponte, however, blew them out of the water. The pizza was flavorful, cheesy, fresh and just the right balance of sauce to dough to cheese. Both of my kids LOVED their slices, and ate the whole thing. In fact, my daughter polished off hers, and then came in for mine! The 4 Cheese slice was garlicy and delicious! I didn't know if I would miss the sauce, since this slice is just a cheese and dough only deal, but I didn't miss it one bit. The oil, garlic and cheese mixture was sublime. I just wish I had ordered two slices, since my kid ate almost my whole piece. Oh, and they drank my whole soda too. Kids are awesome, but not so great at sharing. Unless they are sharing YOUR stuff. Only getting a few bites of my pizza did leave plenty of room in my belly for my dessert! My zeppole was light, airy, and filled with the most delicious, creamy pastry cream ever! It was SO good! 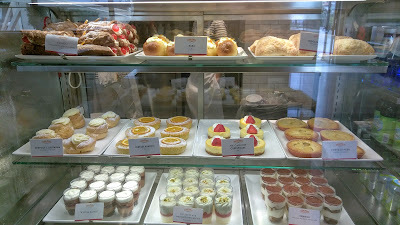 I was very happy with my choice and would love to go back and try more tasty pastry options another time. So, that's it! Another awesome dining option at Disney Springs. Get down here and check it out for yourself! Need help planning your trip and getting a great deal? Contact my friends at Kingdom Konsultant Travel and they'll be happy to help you plan a delicious Disney adventure of your own! Until next time, Disney Fans, have a magical week!!!! !